Through cities around the globe, people took to the streets to march and commemorate the International Workers’ Day. Videos by The Real News take us on a tour of how the day was observed throughout the world. While some places saw peaceful marches, others had violent encounters between armed forces and the protesters. On the first part of the video, an overview of workers in Asia, Africa, the Middle East and Europe. For example, Malaysian activists protested against the growing inequality. In the Philippines were for job security and higher wages. Indonesians protested low wages and rough conditions. Cambodians asked for higher wages. People in Bahrein asked for workers to be reinstated to their positions of which they were removed by the government crackdowns. In Egypt protests were on behalf of including workers rights in the constitution that is being drafted. In Europe, workers protested austerity measures that seem to target them. In Russia, both the ruling party and the opposition had their own rallies. The French left marched against the past of fiscal austerity. And in the London, where May Day is not a holiday, workers went on strike. On the second part, protests in North and South America. Demonstrations throughout Canada protesting budget cuts and rises in college tuition. In the USA, banks were targeted in many major cities including clashes with riot police, calls to strikes, and blockades. In Mexico workers marched to ask the government to do a better job in the face of violence. Honduras saw protests against the privatization of public services as well as corruption. 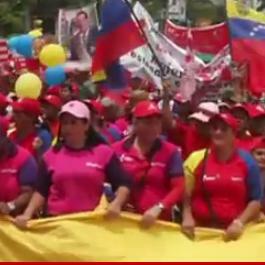 In Cuba, massive parades commemorated the Cuban Revolution and in Venezuela both the government supporters and opposition marched, either for or against the recent reforms. In Colombia there were arrests during the protests and the Chilean student movement also marched.